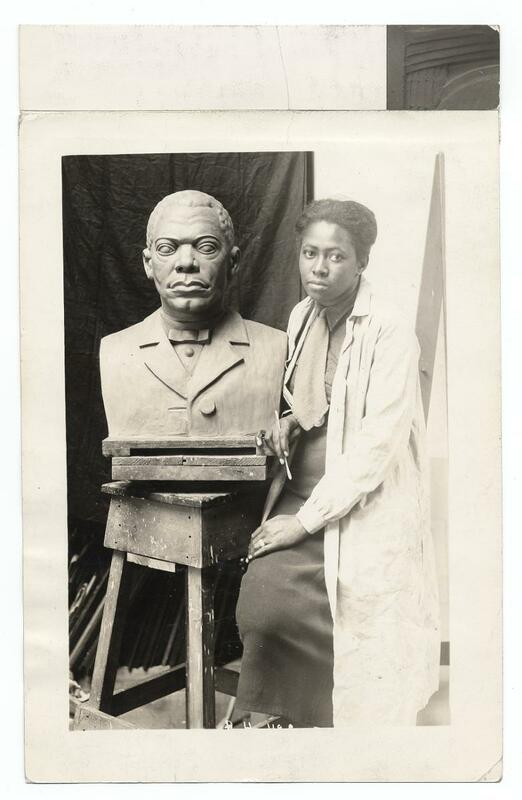 Selma Hortense Burke was an American sculptor and member of the Harlem Renaissance movement. In her long career, she produced numerous symbolically powerful sculptures, including portraits of many prominent African Americans and a bronze relief plaque portrait of Franklin Delano Roosevelt. Part of a work called Four Freedoms, this portrait of Roosevelt is believed by art historians to be the basis for the engraving of his likeness on the U.S. dime. Selma Burke was born on December 31, 1900 in Mooresville, North Carolina to parents Neil and Mary Colfield Burke. Her father was an AME minister, and he also earned income from railroad work. Fascinated as a child by African ritual objects and other sculptural pieces, Burke made sculpture by shaping white clay from her parents’ farm. After being educated at what is now Winston-Salem State University (then known as the Slater Industrial and State Normal School), she trained as a nurse at St. Agnes Hospital Nursing School in Raleigh. Following her training, she moved to New York City to work as a private nurse. In New York City in Harlem, she was introduced to writers and artists of the Harlem Renaissance movement and was inspired to focus on art. During this time she produced sculptural works for the Works Projects Administration and the Harlem Artists Guild. In 1938, she studied with Aristide Maillol and Henri Matisse in Europe after earning both Rosenwald and Boehler Foundation Fellowships. She returned to New York in the late 1930s, opened the Selma Burke School of Sculpture and enrolled in graduate school at Columbia University, completing an M.F.A. in 1941. She later founded another school of sculpture in Pittsburg, Pennsylvania in the late 1960s. In the mid-1940s, Burke won a national competition, securing the commission to sculpt a plaque portrait of Present Franklin Roosevelt, and this is the work that she has become the most publicly well known for. After feeling that she could not capture the likeness of Roosevelt from photographs, Burke wrote the White House and, to her surprise, was granted a sitting with the president. Eleanor Roosevelt later visited Burke’s studio to view the finished plaque. In September 1945, the portrait was unveiled at the Recorder of Deeds in Washington, D.C. And it is this image of the president that now appears on the dime. Although the engraving was officially credited to U.S. Mint Chief Engraver John Sinnock, scholars believe that Sinnock borrowed Burke’s original design for the likeness of FDR that appears on the coin. Burke’s last monumental work, a statue of Martin Luther King, Jr. in Marshall Park in Charlotte, was completed in 1980. Burke was married three times. She died in New Hope, Pennsylvania on August 29, 1995. Her papers reside at Spellman College. And her works are located in many collections, including those of the Smithsonian American Art Museum and the Spellman College Museum of Fine Art. Lewis, Samella S. (2003). African American Art and Artists. University of California Press. "Selma Burke; Sculptor, 94." New York Times, September 2, 1995. Ware, Susan (2004). Notable American Women: A Biographical Dictionary Completing the Twentieth Century. Harvard University Press.